Bandega - Bandega is your home for live indie music in the San Francisco Bay Area. Subscribe to your favorite bands. Get automatic e-mails when they come to town. Bay Area Improvisers Network - Provides a forum for creative musicians in the San Francisco Bay area. At this site, you can find musician's biographical information, upcoming concert info, reviews, links to other sites, and more. Bay Bridged, The - San Francisco Bay Area indie music. Cellar, The - Deep red and blue velvet couches envelop the dimly lit lounge. Grab a seat at one of the alcoves, or challenge a mate to a game of pool. Sip your favorite cocktail at the bar, or get your groove on on one of the two dance floors. Deli, The - Indie music in SF Bay Area. Door Dog Music Productions - Provides resources for musicians, educators, and the avid world music listeners. 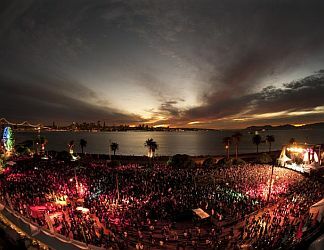 Producer of the San Francisco World Music Festival. JazzWest - Celebrating the best in S.F. Bay Area jazz with exclusive news, artist profiles, concerts and more. KCSM Jazz91 Jazz Datebook - Search for live events throughout Bay Area. Also see Playlist or Listen Live to the KCSM radio station. List, The - Compiled by Steve Koepke: funk-punk-thrash-ska upcoming shows of interest. San Francisco Bay Area Creative Experimental New Music - Dedicated to the creation, promotion, and support of creative experimental performances of sonic art and music in the San Francisco Bay Area. San Francisco Classical Voice (SFCV) - Provides information of many different types: a searchable, sortable events calendar/database that lists almost every classical music event in the Bay Area and enables users to buy tickets and even make dinner reservations; a ticket-discounting program (expanding this year); a multimedia database of composer biographies that is regularly accessed by students of all levels; a glossary of important musical terms; a searchable, sortable database of music teachers around the Bay; lists of music organizations and educational organizations; tips and advice from professionals for parents of young musicians; individual pages for musicians and local groups, and much more. SF Gate: Music and Nightlife - San Francisco Chronicle Bay Area music and night life listings, news, and reviews. SF Station: Clubs Index - San Francisco club listings. SF Station: Music - Concert halls, bars and cafes, restaurants with live music. SF Weekly: Music - Music news and reviews. Sonic Living near San Francisco - Concert discovery service, connecting music fans online and in-person through communities created around live shows of their favorite bands. Through the SonicLiving Wishlist, which seamlessly integrates with iTunes, Pandora, Facebook, Last.fm, and Lala, fans can track bands, receive automatic concert alerts and purchase tickets to shows when they're announced. This webpage last updated on Saturday, January 5, 2019 7:11 AM.